South America (Spanish: América del Sur, Sudamérica, or Suramérica; Portuguese: América do Sul; Quechua and Aymara: Urin Awya Yala; Guarani: Ñembyamérika; Dutch: Zuid-Amerika; French: Amérique du Sud) is a continent located in the Western Hemisphere, mostly in the Southern Hemisphere, with a relatively small portion in the Northern Hemisphere. The continent is also considered a subcontinent of the Americas. South America occupies the southern portion of the American landmass. The continent is generally delimited on the northwest by the Darién watershed along the Colombia–Panama border. Some sources instead suggest the Panama Canal. Geopolitically and geographically all of Panama—including the segment east of the Panama Canal in the isthmus—is typically included in North America alone and among the countries of Central America. Almost all of mainland South America sits on the South American Plate. 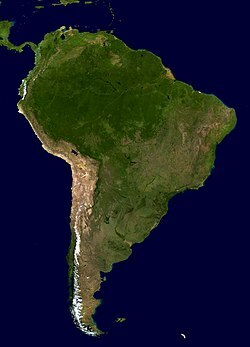 South America's triangular shape gives it the shortest coastline, for its size, of any of the continents. Traditionally, South America also includes some nearby islands. Aruba, Bonaire, Curaçao, Trinidad, Tobago, and the federal dependencies of Venezuela sit on the northerly South American continental shelf and are often considered part of the continent. Geo-politically, the island states and overseas territories of the Caribbean are generally grouped as a part or subregion of North America, since they are more distant on the Caribbean Plate, even though San Andreas and Providencia are politically part of Colombia and Aves Island is controlled by Venezuela. Other islands that are included with South America are the Galápagos Islands that belong to Ecuador and Easter Island (in Oceania but belongs to Chile), Robinson Crusoe Island, Chiloé are also Chilean islands, while Tierra del Fuego is split between that country and Argentina. In the Atlantic, Brazil owns Fernando de Noronha, Trindade and Martim Vaz, and the Saint Peter and Saint Paul Archipelago, while the Falkland Islands are governed by the United Kingdom, whose sovereignty over the islands is disputed by Argentina. South Georgia and the South Sandwich Islands may be associated with either South America or Antarctica. South America is home to the world's highest waterfall, Angel Falls in Venezuela; the largest river (by volume), the Amazon River; the longest mountain range, the Andes (whose highest mountain is Aconcagua at 6,962 m 22,841 ft); the driest place on earth, the Atacama Desert; the largest rainforest, the Amazon Rainforest; the highest capital city, La Paz, Bolivia; the highest commercially navigable lake in the world, Lake Titicaca; and, excluding research stations in Antarctica, the world's southernmost permanently inhabited community, Puerto Toro, Chile. South America was joined with Africa from the late Paleozoic Era to the early Mesozoic Era, until the supercontinent Pangaea began to rift and break apart about 225 million years ago. Therefore, South America and Africa share similar fossils and rock layers. South America is thought to have been first inhabited by humans when people were crossing the Bering Land Bridge (now the Bering Strait) at least 15,000 years ago from the territory that is present-day Russia. They migrated south through North America, and eventually reached South America through the Isthmus of Panama. Some archaeological finds do not fit this theory and have led to an alternative theory of pre-Siberian American aborigines. The first evidence for the existence of the human race in South America dates back to about 9000 BC, when squashes, chillies and beans began to be cultivated for food in the highlands of the Amazon Basin. Pottery evidence further suggests that manioc, which remains a staple food today, was being cultivated as early as 2000 BC. Other important Pre-Columbian cultures include: the Cañaris (in south central Ecuador), Chimu Empire (1300–1470, Peruvian northern coast), Chachapoyas, and the Aymaran kingdoms (1000–1450, Bolivia and southern Peru). The Mapuche in Central Chile resisted the European and Chilean settlers, waging the Arauco War for more than 300 years. European infectious diseases (smallpox, influenza, measles, and typhus)—to which the native populations had no immune resistance—and systems of forced labor, such as the haciendas and mining industry's mita, decimated the native population under Spanish control. After this, African slaves, who had developed immunities to these diseases, were quickly brought in to replace them. The Spaniards were committed to convert their native subjects to Christianity and were quick to purge any native cultural practices that hindered this end; however, most initial attempts at this were only partially successful, as native groups simply blended Catholicism with traditional idolatry and their polytheistic beliefs. Furthermore, the Spaniards brought their language to the degree they did with their religion, although the Roman Catholic Church's evangelization in Quechua, Aymara, and Guaraní actually contributed to the continuous use of these native languages albeit only in the oral form. Eventually, the natives and the Spaniards interbred, forming a mestizo class. At the beginning, the mestizos of the Andean region were offspring of Amerindian mothers and Spanish fathers. After independence, most mestizos had native fathers and white or mestizo mothers. Guyana was a Portuguese, Dutch, and eventually a British colony. The country was once partitioned into three parts, each being controlled by one of the colonial powers until the country was finally taken over fully by the British. Early in the 20th century, the three wealthiest South American countries engaged in a vastly expensive naval arms race which was catalyzed by the introduction of a new warship type, the "dreadnought". At one point, the Argentine government was spending a fifth of its entire yearly budget for just two dreadnoughts, a price that did not include later in-service costs, which for the Brazilian dreadnoughts was sixty percent of the initial purchase. The continent became a battlefield of the Cold War in the late 20th century. Some democratically elected governments of Argentina, Brazil, Chile, Uruguay and Paraguay were overthrown or displaced by military dictatorships in the 1960s and 1970s. To curtail opposition, their governments detained tens of thousands of political prisoners, many of whom were tortured and/or killed on inter-state collaboration. Economically, they began a transition to neoliberal economic policies. They placed their own actions within the U.S. Cold War doctrine of "National Security" against internal subversion. Throughout the 1980s and 1990s, Peru suffered from an internal conflict. Revolutionary movements and right-wing military dictatorships became common after World War II, but since the 1980s, a wave of democratization came through the continent, and democratic rule is widespread now. Nonetheless, allegations of corruption are still very common, and several countries have developed crises which have forced the resignation of their governments, although, in most occasions, regular civilian succession has continued this far. International indebtedness turned into a severe problem in late 1980s, and some countries, despite having strong democracies, have not yet developed political institutions capable of handling such crises without recurring to unorthodox economic policies, as most recently illustrated by Argentina's default in the early 21st century. The last twenty years have seen an increased push towards regional integration, with the creation of uniquely South American institutions such as the Andean Community, Mercosur and Unasur. Notably, starting with the election of Hugo Chavez in Venezuela in 1998, the region experienced what has been termed a pink tide - the election of several leftist and center-left administrations to most countries of the area, except for the Guianas, Peru and Colombia. During the first decade of the 21st century, South American governments have drifted to the political left, with socialist leaders being elected in Chile, Uruguay, Brazil, Argentina, Ecuador, Bolivia, Paraguay, Peru and Venezuela. Despite the move to the left, South America for the most part still embraces free market policies, and it is taking an active path toward greater continental integration. Descendants of Indigenous peoples, such as the Quechua and Aymara, or the Urarina of Amazonia make up the majority of the population in Bolivia (56%) and, per some sources, in Peru (44%). In Ecuador, Amerindians are a large minority that comprises two-fifths of the population. The white/European population is also a significant element in most other former Portuguese colonies. The demographics of Venezuela and Colombia include approximately 20% white and European descendants, while in Peru, European descendants are the third group in importance (15%). Compared to other South American countries, the people of European descent are more of a majority in Argentina, Chile, and Uruguay, and are about half of the population of Brazil. South America is also home to one of the largest populations of Africans. This group is also significantly present in Guyana, Brazil, Colombia, Venezuela, Suriname, French Guiana, and Ecuador. Mestizos (mixed white and Amerindian) are the largest ethnic group in Paraguay, Venezuela, Colombia and Ecuador and the second group in Peru. East Indians form the largest ethnic group in Guyana. Brazil followed by Peru also have the biggest Japanese, Korean and Chinese communities in South America. Brazil is the most diverse country in South America and arguably the world, with large population of Whites, Mulattos, Mestizos, a significant population of Blacks, as well as a sizeable community of Asians (from East Asians to West Asians who are also known as Middle Easterners). In countries such as Chile, Venezuela, Brazil and Argentina indigenous peoples make up a minority of the population. Aymara - lives in the Altiplano of Bolivia, Chile and Peru. Their language is co-official in Peru and Bolivia. Traditional lifestyle includes llama herding. Guaraní - lives in Paraguay where the Guarani language is co-official with Spanish. Mapuche - lives mainly in southern Chile and adjacent pockets of Argentina. Pehuenche - a branch of Mapuches that lived in the Andean valleys of southern Chile (see Araucanian). Quechuas - makes up a large part of the population of Peru, Ecuador and Bolivia. Are diverse as an ethnic group. The Incas spoke Southern Quechua. During the last two decades, South American countries have experienced significant economic growth, which can be seen in many of these countries with the construction of new skyscrapers like the Gran Costanera tower in Chile, and also transportations systems like the Bogota Metro. However, because of histories of high inflation in nearly all South American countries, interest rates remain high and investment remains low. Interest rates are usually twice that of the United States. For example, interest-rates are about 22% in Venezuela and 23% in Suriname. The exception is Chile, which has been implementing free market economic policies since establishing military dictatorship in 1973 and has been increasing its social spending since the return of democratic rule in the early 1990s. This has led to economic stability and interest rates in the low single digits. Tourism has increasingly become a significant source of income for many South American countries. Historical relics, architectural and natural wonders, a diverse range of foods and culture, vibrant and colorful cities, and stunning landscapes attract millions of tourists every year to South America. Some of the most visited places in the region are Machu Picchu, the Amazon Rainforest, Rio de Janeiro, Salvador, Fortaleza, Maceió, Bogota, Florianópolis, Isla Margarita, Nova Santa Rita, Natal, Buenos Aires, São Paulo, Angel Falls, Cuzco, Lake Titicaca, Patagonia, Cartagena and the Galápagos Islands. 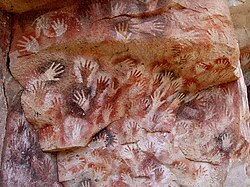 South Americans are culturally influenced by its indigenous peoples, the historic connection with Iberian Peninsula and Africa, and the impact of mass culture from the United States of America, alongside waves of immigrants from around the globe. South American nations have a rich variety of music. Some of the most famous genres include vallenato and cumbia from Colombia, samba and bossa nova from Brazil, and tango from Argentina and Uruguay. Also well known is the non-commercial folk genre Nueva Canción movement which was founded in Argentina and Chile and quickly spread to the rest of the Latin America. 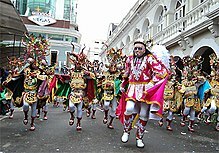 People on the Peruvian coast created the fine guitar and cajon duos or trios in the most mestizo (mixed) of South American rhythms such as the Marinera (from Lima), the Tondero (from Piura), the 19th century popular Creole Valse or Peruvian Valse, the soulful Arequipan Yaravi, and the early 20th century Paraguayan Guarania. In the late 20th century, Spanish rock emerged by young hipsters influenced by British pop and American rock. Brazil has a Portuguese-language pop rock industry as well a great variety of other music genres. The literature of South America has attracted considerable critical and popular acclaim, especially with the Latin American Boom of the 1960s and 1970s, and the rise of authors such as Mario Vargas Llosa, Gabriel García Márquez in novels, and Pablo Neruda and Jorge Luis Borges in other genres. The Brazilian Machado de Assis, a 19th century realist writer, is widely regarded as the greatest Brazilian writer. His admirers include José Saramago, Carlos Fuentes, Susan Sontag and Harold Bloom. Nowadays Paulo Coelho is one of the most read and translated authors. His bestseller The Alchemist has been translated into 73 languages and is one of the most read books in the world. Because of South America's broad ethnic mix, South American cuisine has African, American Indian, Asian, and European influences. Bahia, Brazil, is especially well known for its West African–influenced cuisine. Argentines, Chileans, Uruguayans, Brazilians and Venezuelans regularly consume wine. Argentina, Paraguay, Uruguay, and people in southern Chile and Brazil drink mate, a herb which is brewed. The Paraguayan version, terere, differs from other forms of mate in that it is served cold. Pisco is a liquor distilled from grapes in Peru and Chile. Peruvian cuisine mixes elements from Chinese, Japanese, Spanish, African, Andean, and Amazonic food. Portuguese (196,342,592 speakers) is the most spoken language in South America, followed by Spanish (193,243,411), which is the official language of most countries, along with other native languages in some countries. Portuguese is the official language of Brazil. Dutch is the official language of Suriname; English is the official language of Guyana, although there are at least twelve other languages spoken in the country such as Hindi and Arabic. English is also spoken in the Falkland Islands. French is the official language of French Guiana and the second language in Amapa (Brazil). Indigenous languages of South America include Quechua in Ecuador, Peru, Chile, Argentina, Colombia, and Bolivia; Wayuunaiki in northern Colombia (La Guajira); Guaraní in Paraguay and, to a much lesser extent, in Bolivia; Aymara in Bolivia, Peru, and less often in Chile; and Mapudungun is spoken in certain pockets of southern Chile and, more rarely, Argentina. At least three South American indigenous languages (Quechua, Aymara, and Guarani) are recognized along with Spanish as national languages. Other languages found in South America include, Hindi and Javanese in Suriname; Italian in Argentina, Brazil, Colombia, Uruguay, Venezuela, Peru and Chile; and German in certain pockets of Argentina, Brazil, Colombia, Chile, Venezuela, Peru and Paraguay. German is also spoken in many regions of the southern states of Brazil, Riograndenser Hunsrückisch being the most widely spoken German dialect in the country; among other Germanic dialects, a Brazilian form of Pomeranian is also well represented and is experiencing a revival. Welsh remains spoken and written in the historic towns of Trelew and Rawson in the Argentine Patagonia. There are also small clusters of Japanese-speakers in Brazil, Colombia and Peru. Arabic speakers, often of Lebanese, Syrian, or Palestinian descent, can be found in Arab communities in Colombia, Brazil, Venezuela, Peru, Chile, Argentina, and less frequently in Paraguay. In most of the continent's countries, the upper classes and well-educated people regularly study English, French, German, or Italian, and are typically well-traveled. In those areas where tourism is a significant industry, English and some other European languages are often spoken. There are small Portuguese speaking areas in northernmost Uruguay because of the proximity of Brazil, as well a small Spanish speaking minority in the other side in southernmost Brazil. The cross exposure has led to the creation of the Portuñol creole language.